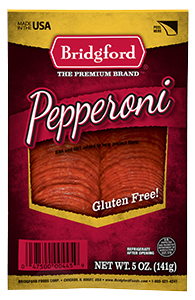 Bridgford Pepperoni Sticks have been some of our most popular dry sausage products. Manufactured in a state-of-the-art food processing facility, each stick undergoes a natural fermentation and aging process, producing an exquisite flavor that our customers have enjoyed for decades. We pride ourselves in the use of the finest ingredients available to make the most flavorful and delicious pepperoni possible. We dare you to find a tastier, better quality pepperoni!